Theresa May’s government survived the no-confidence motion in the House of Commons yesterday via a 325-306 vote, as was broadly expected. The Prime Minister immediately stated she will reach across the aisle and attempt to find common ground with opposition parties on a way forward; she has to present an alternative EU withdrawal plan to Parliament by Monday. The pound advanced, albeit only marginally, as the result was more or less priced in. For better or worse, the Brexit process is now back to square one, with different factions of Parliament calling for different approaches – ranging from another referendum to an extension of Article 50 and more negotiations to a no-deal exit. Hence, business as usual in UK politics, but with one exception: there seems to be a clear majority of lawmakers opposing a no-deal, disorderly exit. As such, while it may take a while to get Brexit clarity, the worst-case scenario for the pound seems to be getting less and less probable as Parliament gets more involved, which may help to keep an implicit “floor” under the currency even amid all the uncertainty. Investors’ risk appetite was reined in yesterday by reports that US prosecutors would pursue a criminal case against Huawei for “stealing trade secrets”. US equity markets pared some of their early gains to close the session only marginally higher, with the S&P 500 gaining a mere 0.22%. Meanwhile, futures are pointing to a lower open today, while risk-sensitive currencies like the kiwi are on the back foot. The latest signals on the trade front have also been less than encouraging, with US Trade Representative Lighthizer reportedly seeing “no progress” on issues such as intellectual property protection last week. Hence, if one excludes the latest dovish shift from Fed and ECB policymakers, the bullish near-term catalysts for equities seem to be running out, leading one to question whether the latest rally can last for much longer uninterrupted. The threat of auto tariffs shouldn’t be discounted either. And while markets have ignored it thus far, the longer the partial US government shutdown lasts, the bigger of a drag it becomes for individuals and businesses; investors won’t remain indifferent forever. As for today, the earnings season fires up with firms like Netflix and Morgan Stanley releasing their quarterly results. The euro continued to underperform the dollar on Wednesday, as more key ECB officials started to shift towards a more dovish stance. The latest was Bank of France Governor Villeroy De Galhau, who echoed the cautious bias of his colleagues, noting that the outlook is clouded by uncertainty. He also said that Eurozone’s growth is merely slowing and that the region is not in a downturn, but admittedly, even the mere reference to a slump doesn’t bode well for sentiment around European assets. The ECB’s Lautenschlager will deliver remarks today, at 1100 GMT. 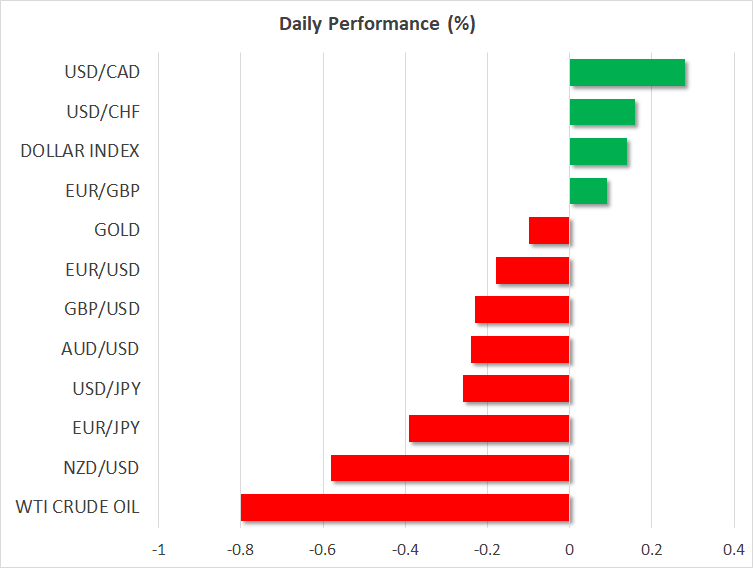 Meanwhile, the dollar advanced, likely aided by an unexpected uptick in the NAHB housing index, which may have alleviated some concerns around a major slowdown in the US housing sector. Today, attention may fall on the Philly Fed business conditions index, while a speech by the Fed’s Quarles at 1535 GMT will also be in focus.